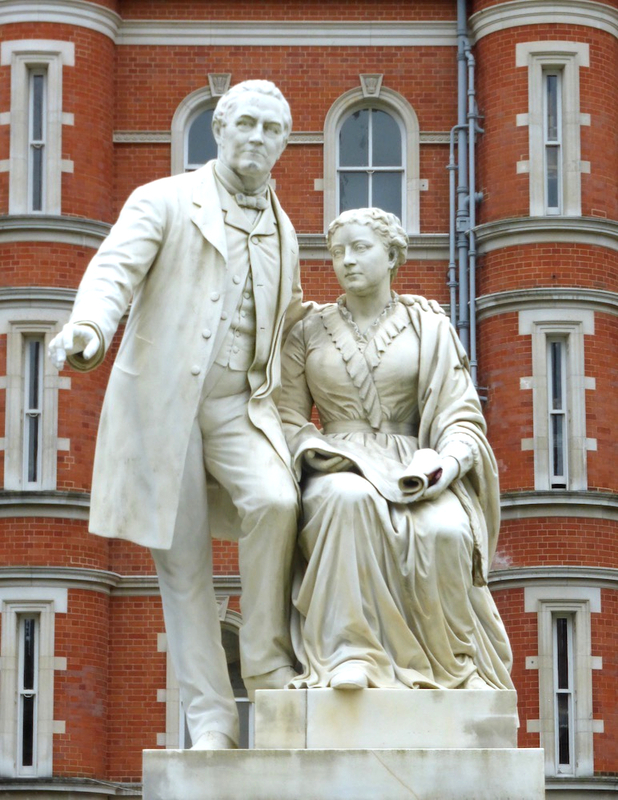 This is a Grade II listed statue of the founder of Royal Holloway College (now, Royal Holloway, University of London), Thomas Holloway, with his wife Jane. 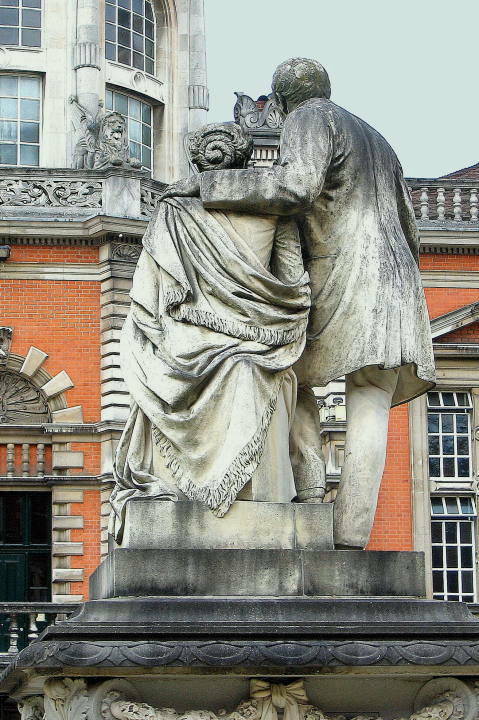 The work of Count Gleichen, Prince Victor of Hohenlohe-Langenburg (1833-1891), it was commissioned in 1883, and unveiled on 15 December 1887 by Lord Thring (see "Royal Holloway College: The Address by the Princess Christian"). 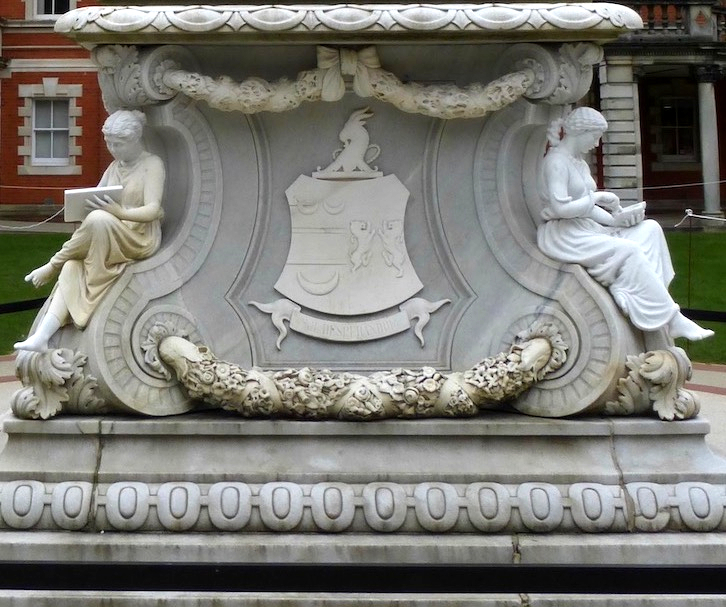 It was carved from white Tyrolese marble, and installed in the centre of the South or Founder's Quadrangle of Royal Holloway, University of London, Egham, Surrey. Note that the railings are new, following a recent restoration, and contain uplights to illuminate the sculpture at night, and also to indicate where the railings are. 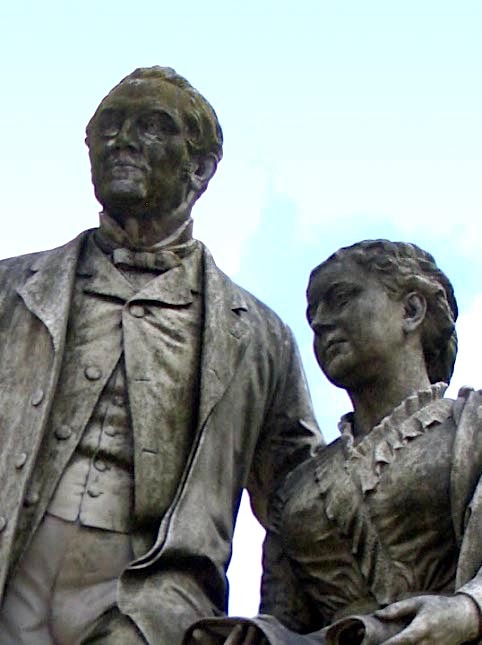 Left: The figures of Thomas and Jane Holloway, from another angle. Right: The base of the sculpture. According to Anthony Harrison-Barbet, Holloway was not a man for honours: he is thought to have turned down the offer of a baronetcy (54). 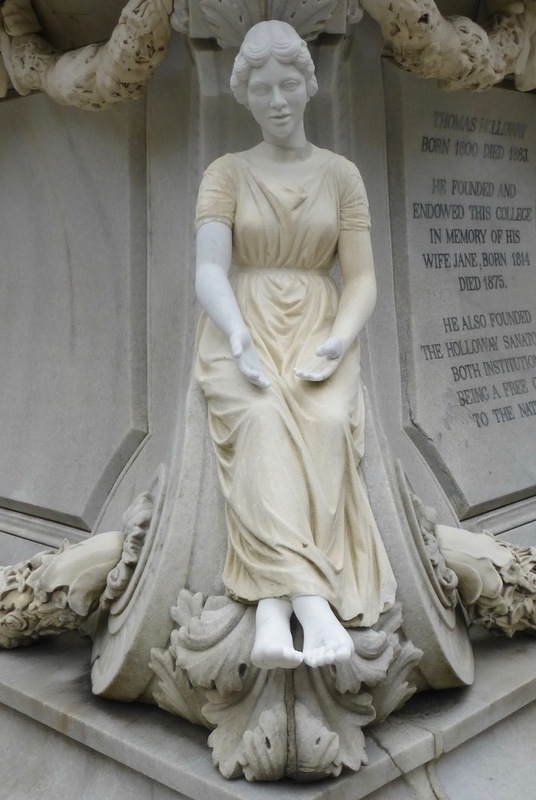 This work was commissioned not by him, but by his brother-in-law, George Martin-Holloway, who also commissioned the statue of Queen Victoria in the South or Founder's Quad (see "Queen Victoria"). 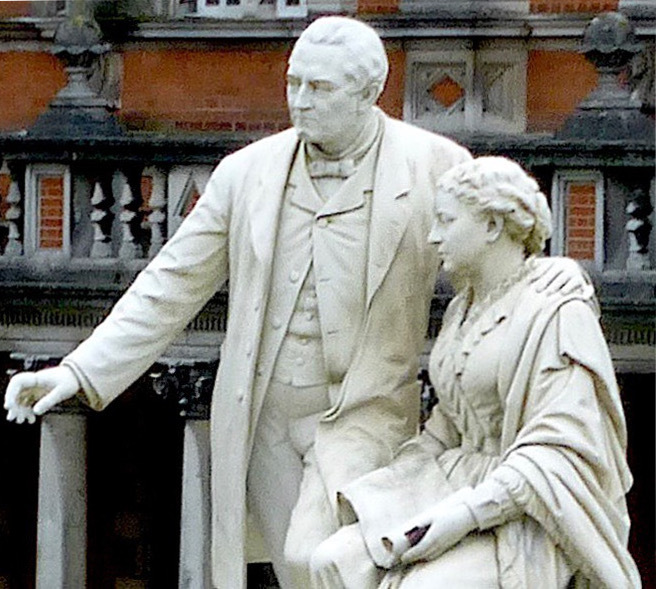 But it is as fine a piece as Holloway could have wished for, with a seated Jane Holloway (who had died in 1875, but who provided the inspiration for the project) holding a large scroll — presumably the plans for the college — and Thomas himself with one arm round her shoulders and the other one gesturing forwards, as if showing her how he would realise the plans. The figures are all the more impressive because they are elevated on a large base. At the front of this is a coat of arms with three crescents and two rampant lions facing each other, with an heraldic goat's head at the top. This was the "unofficial coat of arms" that Holloway had designed himself and used on his stationery (Harrison-Barbet 54). Underneath is the motto from Horace, "Nil Desperandum," which, like the crescents, also appears on the college crest. This may reflect the various hurdles that he had had to overcome — and, when used on the crest, that women would have to overcome, too. In a touch of fashionable baroque, the base is tastefully enriched with swags and geometric elements. Demure and studious female figures are seated at each corner of the base, engaged in various pursuits. According to the listing text in Historic England, these represent the four muses. 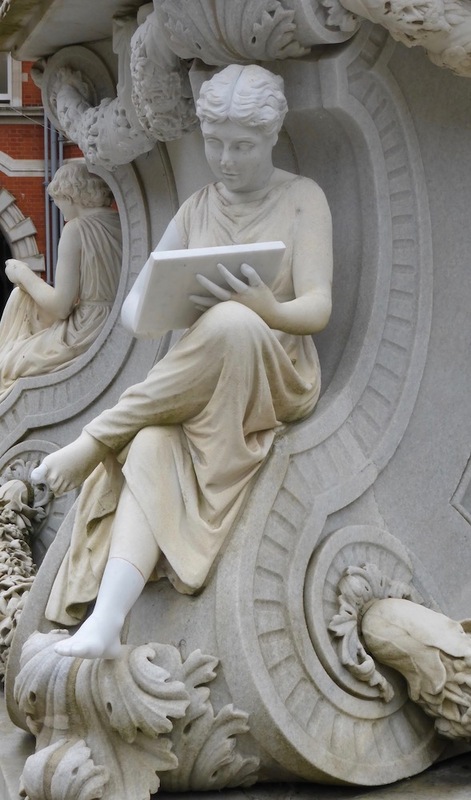 The one on the far left seems to have a writing tablet, and is perhaps Calliope, the Muse of Epic Poetry, but it is hard to say what the others represent. 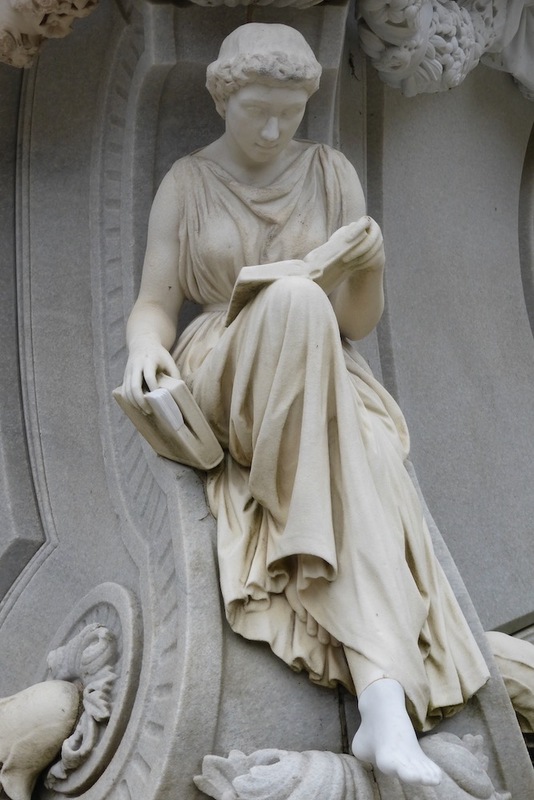 The one next to her is perhaps mixing paints, representing the visual arts; the one with her hands held loosely in front of her might be singing, or simply contemplating; while the one on the far right is reading one book, while holding another so as to mark a page. 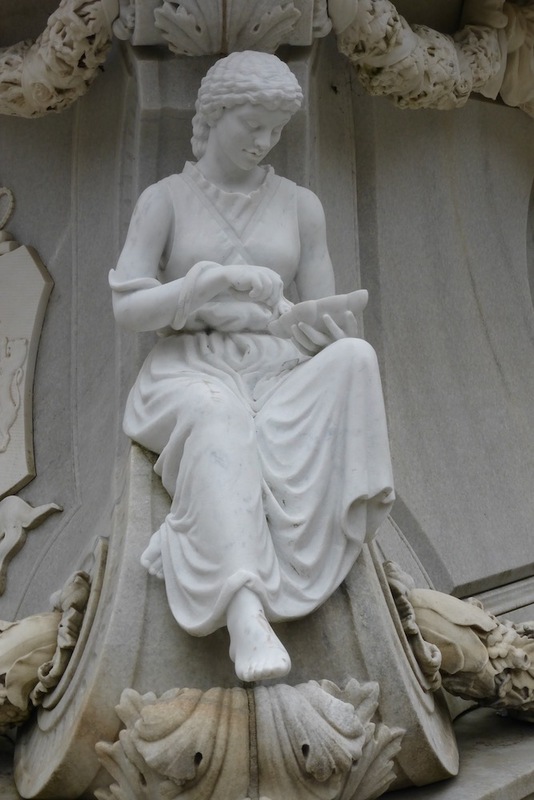 This might be Clio, the muse of history. Taken together, they must have been intended to suggest the kinds of inspiration that would benefit the students of the college. The inscription at the rear or south endof the base. 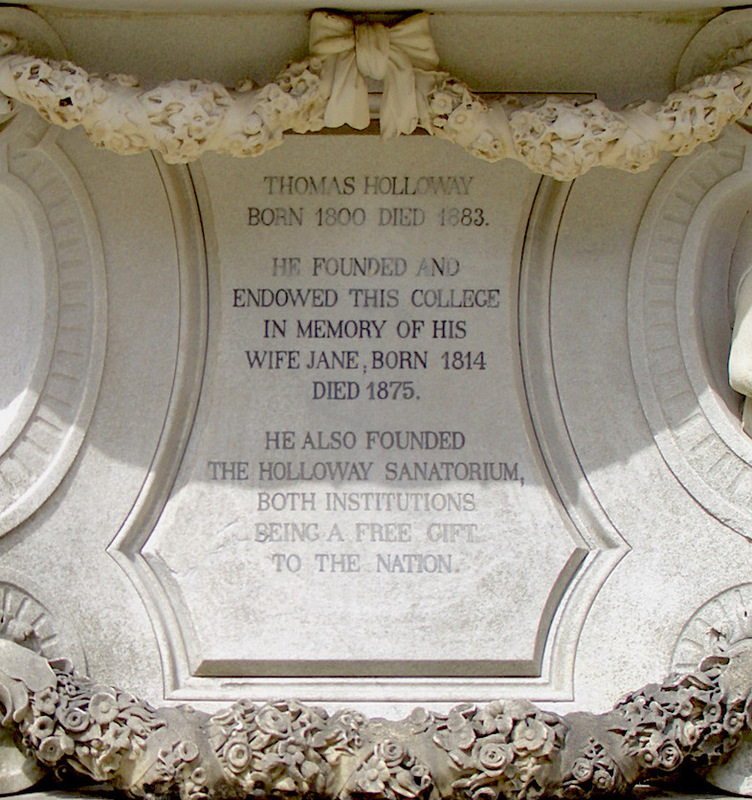 At the back of the base was added the inscription: Thomas Holloway/ born 1800 died 1883/ He founded/ and endowed this college/ in memory of his/ wife Jane, born 1814/ died 1875./ He also founded/ The Holloway Sanatorium,/ Both Institutions/ being a free gift/ to the Nation." The sanatorium, which, like the Founder's Building, was designed and built for Holloway by William Henry Crossland (1835-1908), was also an enormously impressive building with a vast array of gables and chimneystacks. Its walls were elaborately decorated as well. 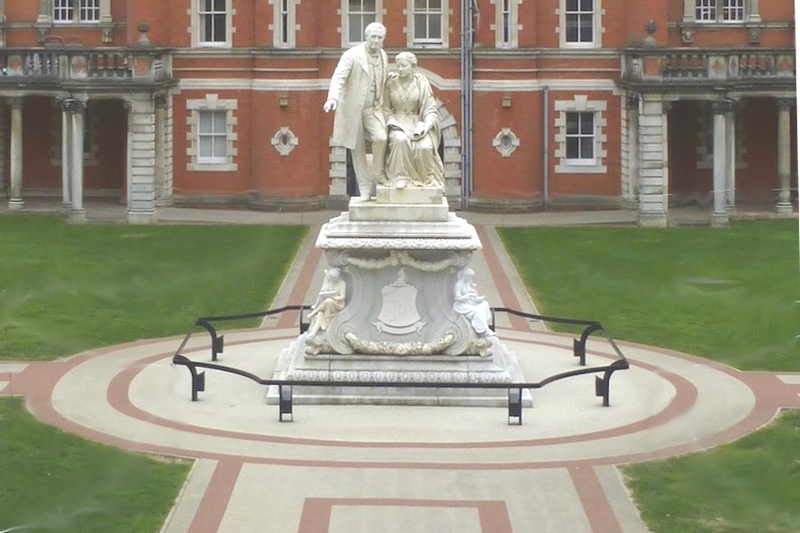 But it was probably here in Egham, at this seat of women's learning, that Holloway would have preferred to be remembered, along with his wife, in this most tangible way. This small selection of earlier photographs shows the sculpture from different angles, before cleaning and restoration work. Harrison-Barbet, Anthony. Thomas Holloway: Victorian Philanthropist: A Biographical Essay. St Austell, Cornwall: Lyfrow Trelispen, 1990. "Queen Victoria." Royal Holloway, University of London. Web. 29 March 2019. "Royal Holloway College: Address by the Princess Christian." The Morning Post. 17 December 1887: 5. Issue 36036. British Library Newspapers, Part II: 1800-1900. Web. 29 March 2019. 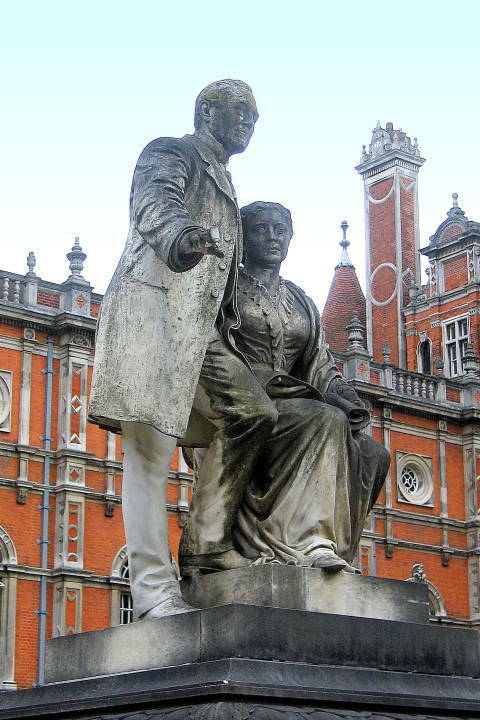 "Royal Holloway College Statue in South Quadrangle." Historic England. Web. 29 March 2019. "Thomas and Jane Holloway." Royal Holloway, University of London. Web. 29 March 2019.